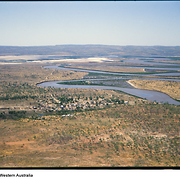 Aerial of Forest River Mission, 1993?, by Woldendorp, Richard, courtesy of Richard Woldendorp collection of photographs, State Library of Western Australia. Forrest River Mission was established by the Anglican church in 1913, on the upper reaches of the Forrest River, near Wyndham. Around 40 Aboriginal boys and girls lived at the mission and were separated from their parents and lived in dormitories. Their lives were closely regulated until the 1950s. The head of the government departments responsible for Aboriginal welfare was the guardian of children at the mission, which closed in 1968. The Oombulgurri Community was established in around 1970. Child welfare authorities continued to place children at Oombulgurri after the Oombulgurri Community was established, at least until the mid-1970s and possibly beyond. According to Neville Green, who has written (2011) a comprehensive history of Forrest River Mission, it was run at first by the Perth Diocesan Board of Missions (p.8) and in the 1920s (p.43) by the Australian Board of Missions who, from the 1920s received a government subsidy for housing children. Children were sent from the Fitzroy Crossing district and east to the Northern Territory border. On 1 June 1955 (p.147), the Australian Board of Missions transferred responsibility to the Anglican Diocese of Perth, which set up a Forrest River Committee. In 1965 an advisory committee was set up in the Kimberley. Forrest River Mission was established by an Anglican missionary, Rev. Gribble, in 1913. A boys' dormitory was built in 1914 and a girls' dormitory in 1915. (Green, 2011 p.39). There was a school at the mission from the outset. Children went to school in the morning and worked around the mission in the afternoons. The school was closed during harvest time. Green reports (p.42) that the dormitories were padlocked, preventing children interacting with family and others at the mission. Forrest River Mission (Green, p.13) was run with strict rules and institutional conventions that included defined hours of 'rising, eating, working, praying and sleeping' and clothing issued by the mission. Children were separated from their parents and boys and girls were kept apart. These practices continued 'well beyond the Second World War' according to Green who observed that children brought up on the mission were 'often ill-prepared for mainstream society'. Green's research (p.83) found that it was only on Christmas Day that boys were allowed to sit with their parents and spend the day with them. Girls were allowed to leave their dormitories, too, but unlike the boys they had to ask permission from staff to leave the dormitory and talk to family and others. Reflecting on the loss of traditional culture, Green (p.19) writes that children were regularly baptised and in the early days they could keep their Aboriginal name as a second name but by 1948, only one name (a European name) was allowed. Until 1928, girls were married to boys chosen by Rev. Gribble when a girl reached puberty. This horrified an observer in 1928 (p.24) as the young couple had no real knowledge of each other or choice in the marriage, which were often contrary to traditional marriage rules, and certainly disregarded them. When the couple had a baby, it was removed to the dormitory. Discipline was harsh, according to Green (p.25): children could be 'strapped, have their hair cropped or made to stand on a box in a public place while balancing a watermelon on their heads'. These disciplines were originally undertaken by Rev Gribble, but were later enforced by schoolteachers and dormitory matrons. Gribble was transferred from Forrest River by the Australian Board of Missions in November 1928 (Green, pp.25, 58). A number of Anglican ministers were appointed as superintendents of Forrest River in the years following Gribble's retirement (p.57). In 1930, (Green,p.65) staff at the mission were accused by the superintendent of sodomising 'mission boys'; a female staff member was accused of 'taking lewd photographs of the girls in her care' and selling those photographs in Wyndham. The staff accused the superintendent of using 'the chain as a punishment'. The superintendent resigned, the male abuser committed suicide and the female was dismissed without criminal charges being laid. In 1936, a new girls' dormitory was built (Green, p.92). In February 1942, after Darwin was bombed, Green (p.98) records that the dormitory children were evacuated to temporary camps near waterholes around the mission. When they returned to the mission, it was to face food shortages during the war years. While this no doubt caused hardship, Green (p.103) reports that it also enabled children to be allowed to search for bush tucker and to join the Forrest River adults in monthly corroborees to share the gathered food. During the war years, the children were also allowed to have regular, organised 'games evenings' which Green says (p.108) helped to break down the gender barrier between the girls and boys in the dormitories. Decisions were taken about clothing the children would wear during the war, when funds were even lower than usual and Aboriginal people were not entitled to clothing coupons. Green writes (pp.116-117) that 'children under five years would not wear clothes; boys between the ages of five and eleven years would wear short pants and the girls of that age would wear only waist skirts'. The older boys would wear shorts and a sleeveless shirt and older girls would have one dress. There was no mention of underwear. Sugar bags could be made into dresses for little girls on special occasions. Weekly washing was done at the river by women and girls in the traditional way. School continued for the children throughout World War II and Anglican schools were asked (Green, p.107) to support 'nominated children'. Until 1947, schooling at Forrest River was held in the open air (p.114). According to Green (pp.124, 127, 132) the Bateman Survey in 1947 criticised the lack of proper education opportunities for children at the Forrest River Mission and authorities felt that the isolated position of the mission would not assist the assimilation policies that were gaining currency. In 1953, Forrest River accepted the offer of a government teacher and very minimal funding for school supplies. Green (p.132) writes that even during the 1950s children had a poor diet, with fresh meat only once a week and damper and tinned meat thereafter. In 1956, after months of planning and considerable bureaucratic juggling, eight children from the mission went to a holiday camp at Point Peron, south of Perth (Green, p.134). In the late 1950s, children were also being given the opportunity to go on school trips to Wyndham (p.134). In 1961, a two-classroom government school was built at the mission (pp.136-137) and in 1963, staff took the children up to Kununurra to see the Queen. In 1968, with mounting debts and large expenses, Green reports (pp.153, 157) that Forrest River Mission was closed by Anglican authorities. Children joined their families and were 'scattered across several Wyndham reserves. On 4 October 1970, Green records (p.162), a group of former Forrest River Mission residents formed the Oombulgurri Committee and decided to return to the land which would thereafter be known as the self-governing community of Oombulgurri. Western Australian historian Neville Green (2009 pp.559-560) reports that in 1926, there was a massacre of Aboriginal people from the Forrest River Mission. In January 1927, Magistrate GT Wood held a Royal Commission into the incident and found that 11 people were murdered and their bodies burned to hide the evidence. Two police officers were charged with one murder, but at the committal hearings Magistrate Kitson determined there was not enough evidence to proceed. Historians and anthropologists have since confirmed the massacre did occur as the superintendent of the mission alleged. Direct responsibility for Forrest River Mission was given by the Anglican Diocese of Perth to subsidiary Anglican organisations from the 1920s, and handed back to the Diocese in 1955. The Chief Protector of Aborigines was the legal guardian of children at Forrest River Mission. The Commissioner of Native Affairs was the legal guardian of children at Forrest River Mission. The Commissioner of Native Welfare was the legal guardian of children at Forrest River Mission until 1963 when could regulate the 'care' of Aboriginal children. Aerial of Forest River Mission, 1993? Sources used to compile this entry: To Remove and Protect: Aboriginal Lives Under Control [website], 2010, http://aiatsis.gov.au/collections/collections-online/digitised-collections/remove-and-protect; Green, Neville, Triumphs and tragedies : Oombulgurri : an Australian aboriginal community, Hesperian Press, Carlisle, Western Australia, 2011. pp.1, 8, 13, 19, 24-25, 39, 42-43, 57-58, 65, 83, 92, 103, 107-108, 114, 116-117, 124, 127, 132, 134, 136-137, 147, 153, 157, 162.; Gregory, Jenny and Jan Gothard [editors], Historical Encyclopedia of Western Australia, University of Western Australia Press, Crawley, W.A., 2009. Green, Neville, 'Massacre, Forrest River', pp.559-560. ; Information Services, Department for Community Development, Signposts: A Guide for Children and Young People in Care in WA from 1920, Government of Western Australia, 2004, http://signposts.cpfs.wa.gov.au/pdf/pdf.aspx; Longworth, Alison, Was it worthwhile?, An historical analysis of five women missionaries and their encounters with the Nyungar people of south-west Australia, Murdoch University, Murdoch, Western Australia, 2005, http://researchrepository.murdoch.edu.au/163/2/02Whole.pdf. pp.298-299. ; State Solicitor's Office of Western Australia, 'Forrest River Mission of St. Michael of All Angels, pp.49-50', Guide to Institutions Attended by Aboriginal People in Western Australia, Government of Western Australia, 2005, http://web.archive.org/web/20140126131607/http://www.dpc.wa.gov.au/lantu/MediaPublications/Documents/Guide-to-Institutions-attended-by-Aboriginal-people-in-WA-2005.pdf; State Records Office of Western Australia, Wards - Director's Approval to Transfer from one Institution to Another and Amend Training, Reference Code AU WA S1099- cons2607 A0191 V4 (p.395) - page numbers refer to PDF page number in digital file held by the Department of Communities (Child Protection and Family Support) in 2017.